The desert elephants of Damaraland are world-famous for coping in their hostile environment, and rightly so, but these are not the only elephants that occur in Namibia. 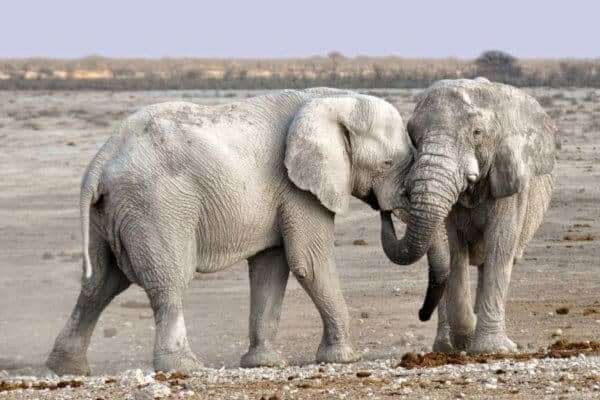 African elephants are found in most of the country’s national parks, with Etosha National Park having the largest population of 2 500 individuals at the last count. These garden-variety elephants are every bit as interesting as their desert-dwelling cousins and can provide hours of amusement to the casual observer. As a member of the Big Five, African elephants are notoriously dangerous when cornered or injured. Strong tusks, a flexible trunk and top speed of 40km per hour pose a considerable threat to any foe, and the average elephant has little to fear from predators, excluding man of course. However, African elephants are generally peaceful when left to their own devices and quite tolerant of spectators, if you keep a respectful distance. It is fascinating to watch elephants munching away on a tree at the side of the road, seemingly deep in thought or splashing and bathing in mud puddles or waterholes. The interaction between herd members leaves no doubt as to their strong social bonds and intelligence. It is believed that elephants are just as smart as chimps and dolphins and that their brain structure is in fact quite similar to that of humans. Conservationists have proved that elephants do show signs of human emotions such as grief, compassion and cooperation too. When they are not around the waterhole sucking up their 200 litre daily quota of water via their complex trunks, elephants spend their time eating up to 260kgs of forage a day. You can always tell where an elephant has been by the broken branches and scattered leaves that remain behind, and while this excess may seem harmful to the environment it is in fact beneficial. Without elephants to keep the trees in check, Africa would soon be overrun by dense forests, leaving nowhere for our savannah animals to graze. Without the masses of manure resulting from all this eating, dung beetles would be homeless and the landscape would be robbed of many tons of valuable fertilizer every day. Elephants are thus a vital part of our ecosystem and must be protected. Do your bit by supporting the charities that are fighting to conserve these amazing animals and by visiting National Parks which use your entry fees towards conservation initiatives.